Best pistol bag on the market, in my opinion. The built in sleeve to hold the gun in place is great. Made of good quality materials. This case is well made and carefully researched. It is big enough to hold a Standard Division racegun and the addition of a strap allows one to carry the gun separately from a range bag while keeping one's hands free. Recommended. Very good quality and easy to carry. Enough space to pistol and magazine(s). Einfach gesagt - PERFEKT! Ich habe vor 20 Jahren meine Peter Stahl (6") in so einem Bag geliefert bekommen und es sieht immer noch gut aus. Extrem belastbar, super Einteilung, toller Schutz. Hab mein STI Bag´s verschenkt und für alle Waffen diese Bags gekauft. Kann ich jedem - der seine Waffe liebt - nur empfehlen! Wie immer: Lieferung - perfekt! Very pleased with the Pistol Bag. fast delivery, excellent service! Used this in "Fältskjutning" in Sweden. In combo with a small pouch holding ammo i could easly walk the course with my gun easly accesible. Works well as a quick guncase in my backpack too and as an improvised small gunrugg. If i would suggest an improvement it would be a little wider shoulderstrap and making the pocket in front a little bit larger. very pleased with the CED1200 Deluxe Pistol Bag. fast delivery, excellent service! Quality Protection for your Valuable Investment! One of the most expensive investments a Sportsman or Competitor makes is his pistol. Therefore, it deserves the best possible protection! 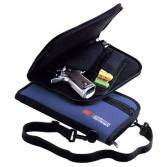 The CED1200 Pistol Bag features a shoulder strap that allows hands free convenient carry. It can also be worn around the waist or across the chest for added protection and safety. The rectangular shape of the bag makes its contents less conspicuous. The inside holster design provides extra protection in addition to the dense foam lining, and prevents any accidental fumbling or dropping of the pistol when removing it from the bag. The magazine pouch allows accessible storage of one double column or two single column magazines. Always readily available if needed! Additionally, the CED1200 Pistol Bag comes with a separate zippered pocket for storage use.